Red Lobster Tucson has four locations in the greater Tucson Area. This makes getting a seafood fix easy satisfy. The original Red Lobster was started in Lakeland, Fla. in 1968. Today, there are over 680 Red Lobster locations in the United States and Canada. This giant seafood restaurant chain has brought fresh calamari, snow crab and key lime pie to the Sonoran desert of Tucson AZ. As well as special fish and lobster items. Red Lobster is definitely one of Tucson’s favorite chain restaurants. It is the spot to go when you’re hungry for Lobster & other shellfish and don’t want to spend alot. Casual and reliable all the Tucson Red Lobster’s provide good value, good service and good food. The food at Red Lobster Tucson is a regular chain menu but it’s pretty good. Especially those famous cheddar bay biscuits! You can’t eat just one. How does Red Lobster do it? These cheddar bay biscuits are over the top good. Some people may possibly search for a healthier item. Buy why? I don’t understand why. The light, airy texture and the aroma and flavor of cheese and garlic is almost addictive. Is there a concern about to much cholesterol? NO way! You can’t eat just one! Red Lobster Tucson is part of a large restaurant chain and that tends to create potential trouble in service and consistency in food preparation. Although not every review is great, Red Lobster Tucson AZ is highly rated. Good food, good service and good prices. There is a children’s menu available at each Red Lobster Tucson restaurant. 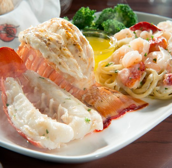 Red Lobster promotions are available for seasonal seafood special and holidays. SUN – THU 11:00 A.M. – 10:00 P.M.
FRI – SAT 11:00 A.M. – 11:00 P.M.
Visit the Red Lobster website for more information. Moving to Tucson AZ or planning for that future place to retire? We can help!